← London 2012, Women’s Final: Netherlands 2-0 Argentina. With both sides trying to pick themselves up from very different defeats in the semi-finals, understandably the first half was a cagey affair with few chances. Great Britain were first to threaten as Ashley Jackson’s wonderful aerial pass set Barry Middleton free. He tried to slip the ball in to Jonty Clarke, but Joel Carroll’s full length dive diverted the ball away from the Reading man to safety. It was the Green and Gold who did break the deadlock, in the 18th minute. A strong forward break by Jamie Dwyer released Simon Orchard in the D. Orchard hit a fierce shot which James Fair got a strong glove on, but could not keep out. It was a shame for the Cannock goalkeeper who went on to have a superb game. The lead was almost doubled shortly after. Glenn Turner found Govers in the D. Fair did well to make a save from the shot and Richard Smith was on hand to complete the clearance. With the crowd fearing the worst, Great Britain got themselves back on level terms. A splendid run from Harry Martin won a penalty corner. With everyone inside the arena expecting an Ashley Jackson special, the home side sprang a surprise, with Jackson instead finding Iain Lewers who finished in style to haul the hosts level. They almost took the lead, as Jackson again supplied the pass for Matt Daly, but his shot was well kept out and the scores remained 1-1. 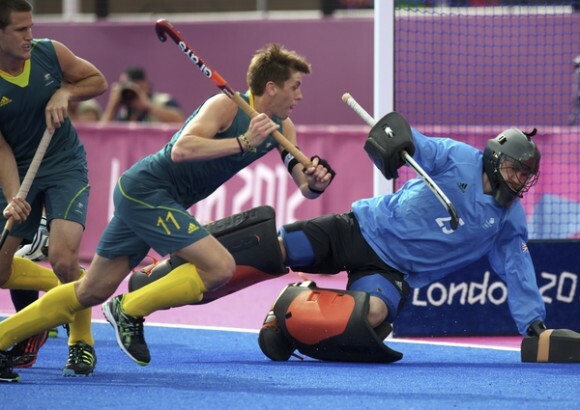 Australia won another penalty corner on the stroke of half time, after James Fair’s excellent save hit Lewers’ foot. This time the Cannock goalkeeper used his foot to deny Christopher Ciriello. 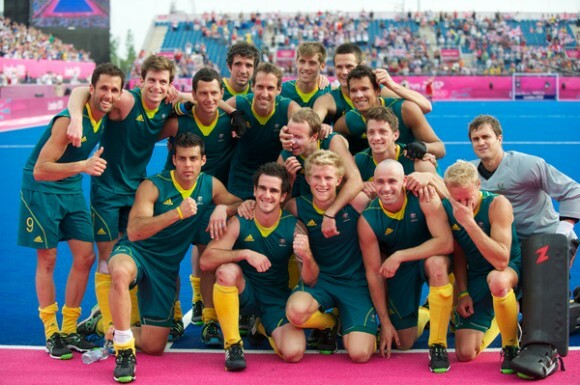 In the second half, Australia continued to turn up the heat, forcing a series of penalty corners. They finally took the lead in the 48th minute. Again, Fair did well to keep out the initial effort from Matt Gohdes with his helmet, but the ball popped up invitingly for Jamie Dwyer who forced the ball home, despite Barry Middleton’s efforts on the line. Fair, GB’s outstanding player on the day did brilliantly to keep out Russell Ford as the Kookaburras tried to put the game beyond their opponents. There was little the goalkeeper could do in the 57th minute. Jamie Dwyer engineered space in the D, and hit a shot on the turn. Fair saved again, but Govers was on hand to prod home the rebound for 3-1. Great Britain steeled themselves to try and get back level. Both Daly and Clarke went close, but in truth, Australia’s defence was resolute and they were in no mood to be denied. 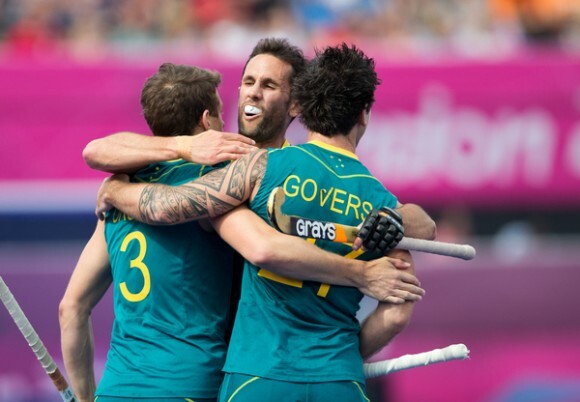 The Kookaburras will have felt a sense of déjà vu from Beijing. Having looked impressive in the pool stages, some were already hanging the gold around their necks. However after being dumped out by Spain last time out and Germany this time, they once again had to settle for bronze. Great Britain’s players were bitterly disappointed. Despite the fevered support of the home crowd and a spirited display, they had ultimately come up short, firstly against the Dutch, and then against the World’s number one side. Ranked 4th in the world going into the competition, some would say 4th place is about right. Others are arguing that GB’s best prepared side in history, on home turf can see this as a chance missed. Whatever your opinion, you cannot deny, this has been a splendid competition, from start to finish.